Batter and Beat: The Trifecta! There's no denying that these ingredients on their own are delish, but combine the three together (preferably in cookie form), and you better slip on those elastic waist pants. These cookies are seriously a crowd favorite; even my husband, who has always been more of a savory snack kind of guy cannot resist. This recipe makes a generous 4 dozen...that is, if you can contain yourself from eating most of the batter. Position the racks in the upper and lower thirds of an oven and preheat to 375°F. Butter 2 cookie sheets OR line two cookie sheets with a silicone baking mat. In a small bowl, whisk together the flour, salt and baking soda. In the bowl of an electric mixer, beat the butter on medium-high speed until light and fluffy. Add the brown and granulated sugars and beat until light and fluffy. Add the corn syrup and beat until well blended, then beat in the milk and vanilla. Reduce the speed to low, add the flour mixture and beat just until smooth, scraping down the sides of the bowl with a rubber spatula as necessary. 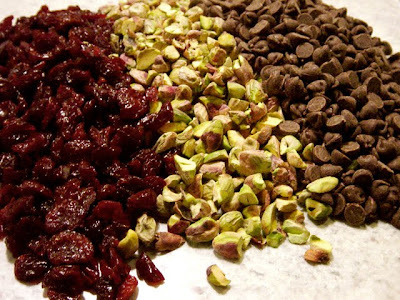 Using the spatula, stir in the chocolate chips, pistachios and cherries. Transfer the dough to a work surface and press it together with your hands. Shape the dough into 1-inch balls and place them about 2 inches apart on the prepared baking sheets. With the palm of your hand or the flat bottom of a glass, flatten each ball into a disk about 3/8 inch thick. Bake for 4 minutes, switch the position of the pans and bake until the cookies are light golden brown, 4 to 6 minutes more. These cookies are a terrific tasty treat! They are crispy and chewy all in the same bite. The cherries give this recipe real appeal. Don't pass these up if you ever stumble upon them. 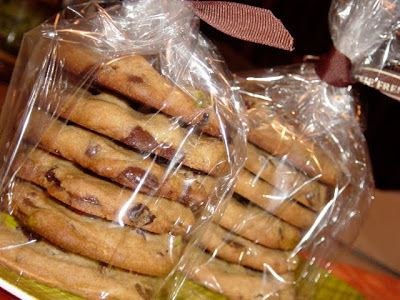 Do you have a recipe for cookies with peanut butter and chocolate? I love that combo! All this cake is going to my bundt!